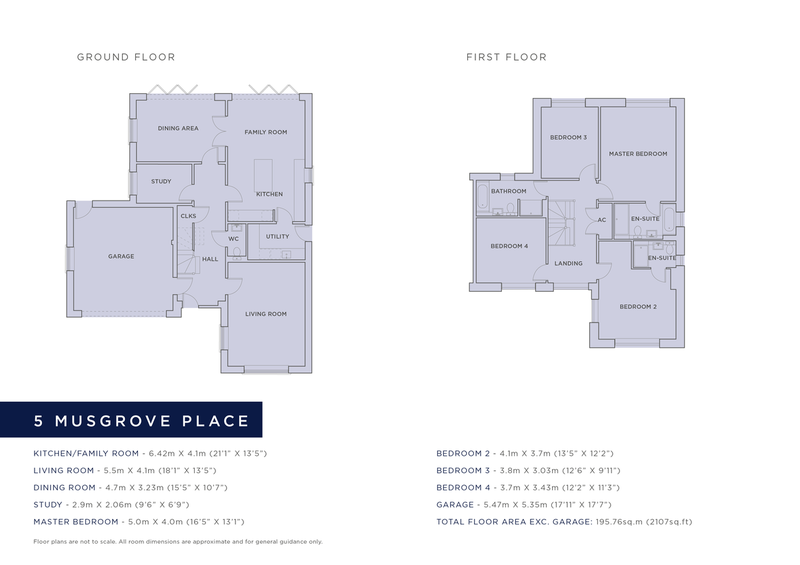 Musgrove Place is a superb collection of five, four and five-bedroomed homes, each with gardens and garaging, conveniently set in a popular town location. KITCHEN/BREAKFAST AREA & UTILITY ROOM:  The kitchen is equipped with a range of Crown Zeluso wall and floor cabinets, plus an island unit (exc. plot 2), all with solid quartz worktops and upstands. ENTRANCE HALL AND STUDY:  Porcelain floor tiles to entrance hall, and study (where provided).  Aluminium framed folding/sliding doors provided to the kitchen/breakfast area and living room.  Flue system built in ready to accept a wood burning stove.  Handmade clay roof tiles. TENURE & SERVICES:  Freehold.  Properties connected to electricity, gas, water and mains foul drainage.